The last three days have been hot, humid and (finally) SUMMERY!! Everything in the garden seems to have popped! I saw a few regular tomatoes growing in Tomato Land. And some cherry tomatoes too! :) The Romas are flowering now since I pruned off the yellow leaves, fingers crossed! 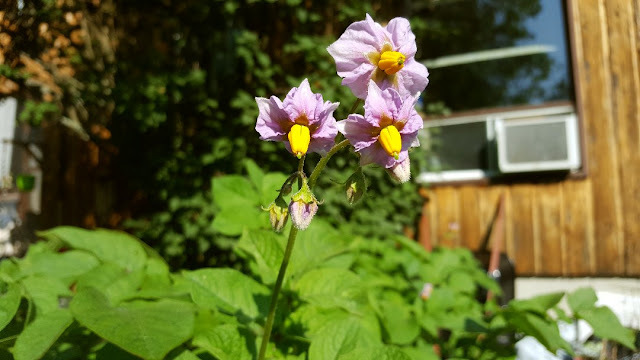 My potatoes are starting to flower too, aren't those flowers pretty? I've been spending most of the last few days with my nose in cookbooks and flyers. 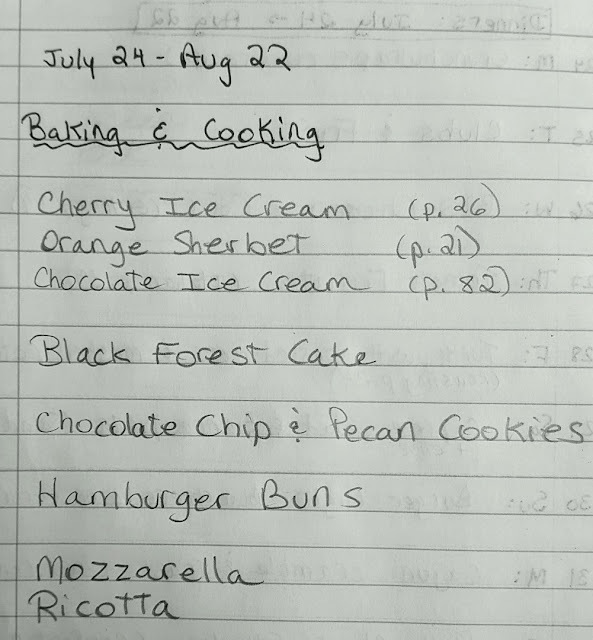 This is my baking and cheese making list for the month. I usually always make more stuff but these are the planned items. Alex and I have made so many different cherry concoctions lately! One of the liqueurs will be ready to taste on Tuesday which means we'll have lots of brandy-soaked cherries - thus the ice cream and the cake!! Speaking of cherries, we're at it again! They're back to being a good price! I'll have to check the quality at the store, but if they're good, we will be making more spirit-infused cherries and various liqueurs! Monday is my monthly shopping day so I had 30 days of meal planning to do. I'm on Day Three of the Planning. Day One: Download and look through all the grocery flyers for this week; make a list of things we need and update the freezer and pantry inventory. - done! Day Two: Go through the cookbooks, my online recipes and my recipe idea list and plan 30 dinners based on flyer sales and what I have on hand. - done! Day Three: Make a shopping list for each dinner, baking and cheese making item, make a list of what needs labeling and "reserving". Schedule each dinner to a date. - done! If anyone wants dinner ideas, I'm starting to post my menu planning on separate pages. 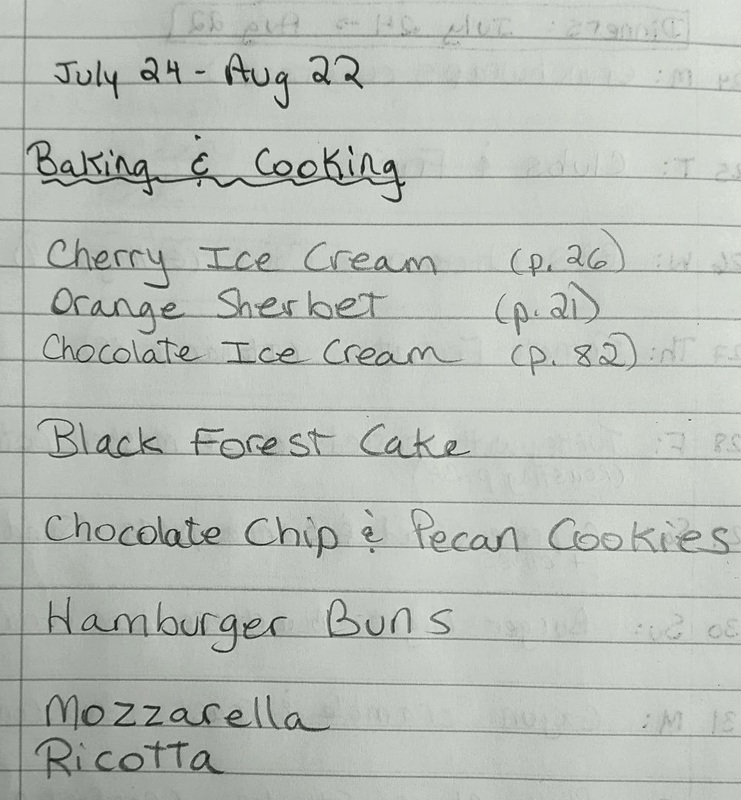 Here is my 30-Day Menu for July 24th through to August 22nd page. I've included links to recipes where I could, if they're online or I've posted them before. So the last step is to make an actual shopping list and estimate the prices based on flyer sales and past shopping bills. If I'm over budget, I need to cut things out or change the meal plan a bit. That's Day Four of my process! It sounds like a lot, but I've found I'm less stressed when I take four days to plan for a month, then get it all over with in one day. It works for me. I love cherries 🍒They're a fantastic food to have. I also love the idea that you want to grow your own produce to go with the cheese you're making. Man, that's a good idea. I wish you the best of luck with that one. Do you do all your shopping for the month ahead then? That's a biggie. I've never tried that. We used to be quite good at cooking when I was home (5 years ago) but Mandy looks after it all now. The thing that really interests me is that you really plan ahead with everything. It's a great quality to have, i think. That's a great-looking garden I can see. Isn't it amazing how life is? One minute you're fine, the next you're not. Do me a favour and make sure it doesn't happen to you. Make sure Alex is insured so that you don't suffer. You never know what's going to happen in the future. I'm trying to drum it into my lad. Anyway, that's enough of me preaching the gospel according to Treey. Actually my real name is Terry, but I use the name 'Treey' because that's how our wedding albums were done. The wedding photographer we had couldn't spell the name 'Terry'. He's dyslexic.So there you have it! I have to explain it to everyone. i hope you get lots of stuff from your garden. mine is a disappointment this year. my peppers are great but today i ripped out almost all of my tomatoes. i don't know what is wrong with them but they looked awful and i just gave up. i pulled out the eggplants too. i guess i will just be hitting farmer's markets the rest of the summer. it's just been so hot and humid here. The tomatoes are looking good, I have a few green ones, just have to wait a while I guess. You are so very organized about your meal planning! It's great that you've put the time and effort into working out this system mainly because you don't like to grocery shop. (That's something I've always liked to do. We're all different, aren't we?) And, of course, your way of doing it saves a LOT of money, I'm sure. I think people who have no plan at all regarding shopping and menu planning spend many more $$ than they would ever guess. There is a lot to be said for meal planning - just like any kind of planning. Congratulations on the tomatoes! Cherry spirits are the best. I miss Kirschwasser. I am so impressed that you grow potatoes! I don't know anyone that's done that. I'm also impressed at all your meal planning. I should start doing that when all our house renos are done. I figure I'll have a lot more time to mess around in the kitchen in the fall. I used to do a lot of baking and cooking before, and freeze many things for future meals. That was very enjoyable. I'm going to check out your meal plan and see what's on there. Perhaps steal a few ideas while I'm there :) Hope your weekend is off to a great start! My tomatoes are still flowering and my potatoes dont even have flowers yet. I agree tho...i think every year, those potatoe flowers are too cute. I love cherries ... and since they are so cheap right now, the whole house is snacking on them all day. Wherever u go u find cherry pits laying around. Cherries are expensive here, blueberries too. I buy organic, and they are not available as much in our area. Hence, why we planted a cherry tree. You are lucky to find good cherries and a good price. My meals here generally fall around the harvest of the garden. What's producing typically ends up in the dinner. Right now it's zucchini, cucumbers, beets, green beans, and some peas yet. Have a great weekend. You are a very organized person. That kind of budget and planning discipline is very good! Hi Terry-Treey :)) That's an interesting story about your name! And I don't mind the gospel of Treey at all. You're right because we just never know what will happen the next moment. We plan for the future and dream about the future, but things can change in a heartbeat. I kind of went through that with the burnout, thinking I had a big bright future in the stock market then it happened and the struggle was the biggest challenge of my life. I heal and improve daily, but it'll never go away. Alex and I work towards being as prepared as we can because we both want to make sure the other is taken care of. Lots of people don't think about that, but I think it's vital. I don't know how to feel about the fact that you enjoy grocery shopping! ;) It creates so much stress for me, this monthly shopping is the only way I can survive!! But I still need a few days to recover after that too. I just find that people are so rude and impatient, it's never been a pleasant experience for me. It's an initial investment because you need to have a month's worth of food money available but once you get into the rhythm, it does save a lot of money. Not just on groceries, but also on gas expense. Hi TB :) Alex is making a non-distilled version of Kirschwasser! We're really excited about trying it out. If it's good by next week, I'll use it in the Black Forest Cake I think. And thanks! I'm so happy I have tomatoes! I also have some lemons turning slightly yellow! With everything going on, I keep forgetting to report on my lemon tree! Hi Martha :)) Go ahead and steal some ideas! But remember, our diet is comfort-heavy! :) No slim people in this house lol...This is my first year growing potatoes. Lots of the folks in our blogging community grow them too, and in old tires, that seems to be very successful. I was going to use my old winter tires for the potatoes this year, but I opted to get a few of those black garbage bins at Canadian Tire and try that out. We don't want to destroy the winter tires until we can make sure we can afford to buy new ones! I have to wait until the fall to harvest them and I'm so excited about it!!! Actually it was my blogger friends who encouraged me to try them out. :) I hope your renos go well and quick! It must be hard to have that going on, especially in the summer. Hey Nik :)) This is the first potato planting for me and I really like those flowers, never saw them before. They kind of look like little squash growing! Oh, we kept all the cherry pits!! Alex is infusing them in brandy to see how that tastes! I love cherries! I wish we could get them year round! The monthly shopping I started last fall so it's been 9 months now. The first few months were tough because I was just learning everything, and Christmas time was a bust! But I guess officially it was January since I implimented it regularly. It is SO MUCH easier! You just need a plan and time to do it. The feeling of not having to drive to town more than once a month is all I need to motivate me! Plus, all the dinners are planned so I don't have to worry about what to cook. You know me, I get easily stressed and overwhelmed, so if I have no idea what's for dinner, I don't even feel like trying. I had to stop that habit too. I love to cook and we love to eat! Dinner for us is time together and enjoying food and drink, so I just love to make it special. And really sis, I have been saving a lot of money shopping this way. Hi Jenn :) Thank you :) I'm so happy I started the garden this year and didn't wait for when we moved. It's so rewarding...and frustrating at the same time!! I woke up to 12 degrees this morning after melting at 32 yesterday. I'm hoping the sun will stick around now. It took me a few months to get the monthly planning down, but now it's so easy and saves me lots of stress and money so it's worth it. I have the time to do it, I know many people don't so I think that's why it works for me so well. I love your shopping and planning lists. I really need to get back to it once we've moved. It's all over the place at the moment and I'm back to shopping two or three times a week! Not good. Yarrow you are trying to make me jealous!!! :) I want cherry trees!!! It could happen in the future if we have the proper set up...we need a greenhouse for that in this climate I think. I tried to plant ground cherries but they didn't budge this season. Wasn't meant to be! I don't blame you for shopping so often right now, you have so much on your plate to concentrate on much else! My tomatoes are coming in strong now. I trimmed the vines this morning to give the center of the plant more light and air. This afternoon it's raining pretty hard. A long nap on a rainy day felt good but it was hard to get up. Cherries are one of my favorites. Hi John :)) When it's humid and rainy, I lack energy so naps definitely happen here too! 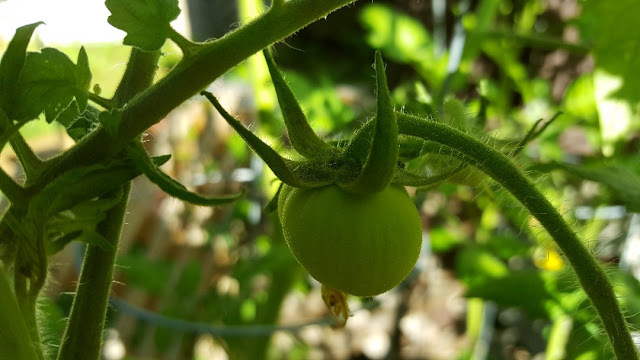 I found that my tomatoes really started to flower once I pruned all the lower vines and smaller ones from around the middle. They are really tall now, but I'm seeing more and more little globes forming, it's fun to see the fruits of my labour! I'm glad your tomatoes are healthy! Cherries!! I love them, but they are always an expensive item to buy, just small punnets of fruit that I can gobble at one go. My cherry tomatoes are grown inside and are cropping well and outside some much-needed rain has got the courgettes and beans going crazy. We are eating well! Hi Rosemary :)) I'm glad you're having a great gardening season! I'm pretty impressed with what's growing here despite the cold and rain though. I'm seeing more and more little tomatoes forming! Those cherries are really good, but I agree, way too expensive! Such a good price for cherries! We never see them that cheap here. I discovered a weird thing on my potato plants. 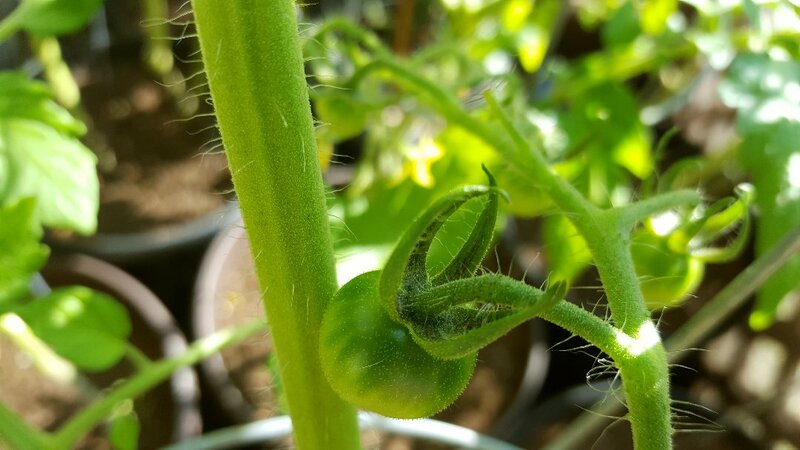 They are growing "tomatoes" or what looks like green cherry tomatoes. I googled it and apparently this can happen. They are called potato fruit. Not edible tho - just neat to look at! Yay for cherries! Love them except merishino (sp? )...I ate a whole jar as a kid and cannot stand them to this day....and yes, I got very sick after eating the whole jar....too much of a good thing, I guess....lesson learned. Your garden is doing great, No problems with deer there? They've eaten my tomatoes, my beans and my hibiscus....I give up! For this year anyway but I have herbs and some cherry tomatoes and lots of gorgeous flowers. I used your method pretty much for when the grands were coming and it worked perfectly! I definitely got more for my money and I will keep doing it and refining it as I go along. 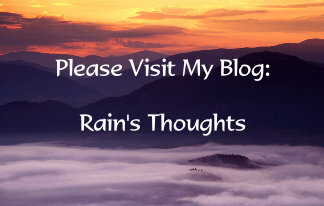 Thank you so much for sharing your methods and planning and what you do when...it really helps! 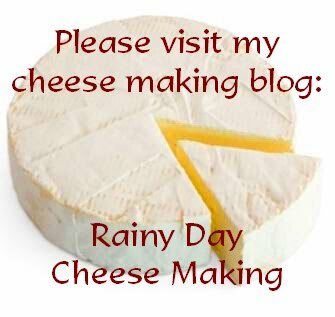 Now I need to get 'cheese making'! Hi Sam :)) Alex and I call those Maraschino cherries "nuclear cherries" lol...we realized a while back that we are both intolerant to the food dyes they put in their to make them that colour! We used to eat them or put one in a drink, but we don't have any in the house any more, just the real ones! I'm not surprised you got sick, but a whole bottle lol? You know, my Grandma used to say that those cherries stay in your stomach for 7 years each...but she said the same about swallowing gum, it would stay in the stomach 7 years. Scared me enough not to swallow my gum! The deer here stick mostly to the upper part of the village and they feast on the community garden a block away. So far they haven't come into the yard, but maybe they smell the dogs? And you're welcome!! I'm glad the bulk shopping saved you money, and time right? Only problem is I need a bigger fridge...everything gets so jammed in there the first week or so!